Did you like March of the Penguins, but wished that the penguins also sang? Well, then Happy Feet is the movie for you. It is certainly one of the stranger films in recent history. It begins as a standard coming-of-age cartoon, but morphs into a darker story about conservation. It is also full of singing Emperor penguins, which, according to the film, sing in order to find their mate. 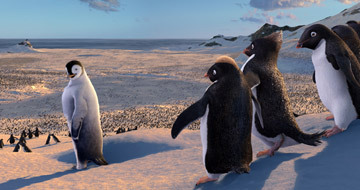 Yes, the film is pandering both with the songs and with the cuteness factor of the penguins, but there is something infectious about the constant music and the happy feet of Mumble, the penguin who tap dances and cannot sing. Mumble (voiced by Elijah Wood, Everything is Illuminated, Green Street Hooligans) was created using motion capture on dance virtuoso Savion Glover. The concept of a tapping penguin is odd, and works up to a point. Mumble's parents, Memphis (voiced by Hugh Jackman, Flushed Away, The Prestige) and Norma Jean (voiced by Nicole Kidman, Bewitched, The Interpreter) are not too sure what to do with their son. As soon as he was born, he started tapping his feet. Other penguins view him as an embarrassment. While other young penguins begin singing beautifully shortly after they are born, Mumble cannot carry a tune to save his life. Gloria (voiced by Brittany Murphy, Sin City, Little Black Book) on the other hand, probably has the best voice around. Mumble has a huge crush on her, but realizes it's a lost cause; he has to compete against all of the other penguins out there. The penguins are a superstitious bunch. Food is scarce, and many of the elders view Mumble as trouble. Circumstances lead him to Ramon (voiced by Robin Williams, Man of the Year, Everyone's Hero) and his friends, a bunch of Adelie penguins ( i.e., shorter and weirder looking). Unlike the emperor penguins, Ramon and his friends love Mumble's abilities, and take him on like a brother. From there, director/writer George Miller (Babe: Pig in the City, Lorenzo's Oil) and screenwriters Warren Coleman, John Collee (Master and Commander: The Far Side of the World), and Judy Morris (Babe: Pig in the City) take things in a direction that is completely unexpected. It's nice that they are doing something original, but the tone of the latter portions of the movie are too far out of sync with the beginning. The carefree atmosphere is replaced by something dark, almost sinister. It may be a bit much for smaller kids. Other dark elements like seal attacks or infant death may seem heavy for kids, but unlike what most adults think, they can handle it (heck, ever watch Snow White?). The animation looks fantastic. Penguins already look ridiculous tottering around on the ground. When Miller combines this with singing and dancing, everything looks surreal (especially when a Fat Joe-voiced penguin begins rapping). Like most other CGI films, the detail is impressive. 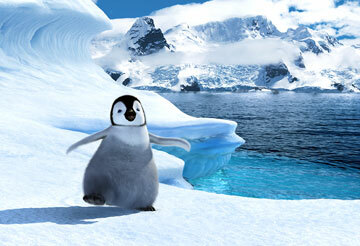 Because Happy Feet takes place in Antarctica, things like civilization and people are not there. This makes the role of CGI much easier, as humans are notoriously difficult to animate in a life-like manner. Aside from some ocean-blue eyes on Mumble, most of the other penguins look like real animals. Real animals that sing. And tap. Happy Feet does begin to get overly preachy as it reaches its conclusion, but it is a nice enough diversion in the meantime. 1 hour, 40 minutes, Rated PG for mild peril and some rude humor.